Ingrid here today with a chest of 4 drawers with 4 different Maja collections. Vintage Spring, Vintage Summer, Vintage Autumn and Vintage Frost. All of the Maja collections work so well together!! The lovely handles come from a Dutch online store: Scrap-Unlimited. They have the most beautiful metal embellishments! These gorgeous tulle flowers and the white paper flower are from 13Arts. Love to use them on a project! Also made some flowers with the Maja collections. The big flourish and also the mini fleur des lis on the drawers are from Dusty Attic. A close up from the hand made flowers. Top view of the chest with the No. XII from the Vintage Autumn collection. You can’t have enough of these so I made a card as well. For this one I used the Vintage Autumn and Vintage Frost collection. 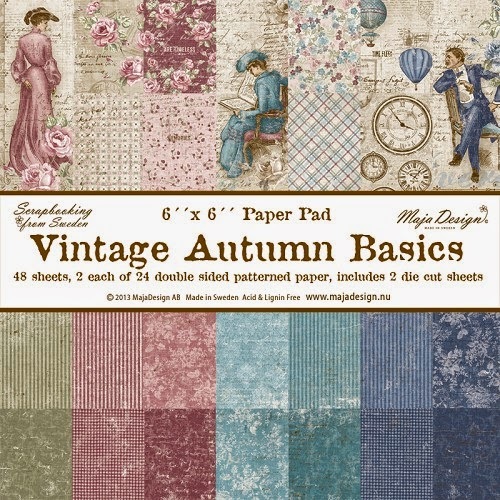 The background comes from the 6×6 pack of the Vintage Autumn collection. Chipboard is from Dusty Attic and the twigs are from 13Arts. Hope you liked my todays post and you will be inspired to combine all the wonderful Maja collections as well! Oh my god, this is sooooooo beautiful and soooo well made, I´m in total awe about this cheast of drawer here. I LOVE it. What a gorgeous set of drawers! LOVE how well the 4 collections go together!! Wish they were more accessible here in the US! I have a few of Maja Designs papers but have such a difficult time finding them! LOVELOVELOVE your card also! TFS! Absolutely stunning! What a wonderful make Ingrid!! Love the card too!! That is such a stunner! Love it and the fact that you’ve used several basics collections to alter it. Fabulous! The drawers are absolutely stunning….and a perfect example of how beautifully the Maja Design paper collections blend with each other! Gorgeous card as well!!! I always look forward to your amazing creations!